VTX Control utilizes SmartAudio or Tramp and allows you to change VTX settings such as channel and output power from Betaflight OSD or Taranis LUA Script. VTX Control is also sometimes called “VTX Telemetry”. No more fiddling with dip switches or push buttons! It’s so much easier to be able to change VTX settings remotely using your radio transmitter. It might not sound like a great deal, but once I tried it on my quads a few times, I was totally blown away how convenient it was and I strongly recommend giving it a go yourself! VTX Control is useful, say when you was in race and you crashed, you can enable PitMode on your VTX right from your seat without rushing to your quad. This ensures minimal disruption to other pilots who are still in the air, and potentially protects your VTX from overheat due to the lack of airflow. Check out our VTX guide for beginners. One issue with VTX control from OSD is that you have to be on the correct channel to begin with, otherwise you would have to go through the frequencies on your VRX to find your VTX channel. That’s why it’s probably easier to do it from your Taranis Screen using Lua script, you can change video transmitter settings regardless of your VTX channel. 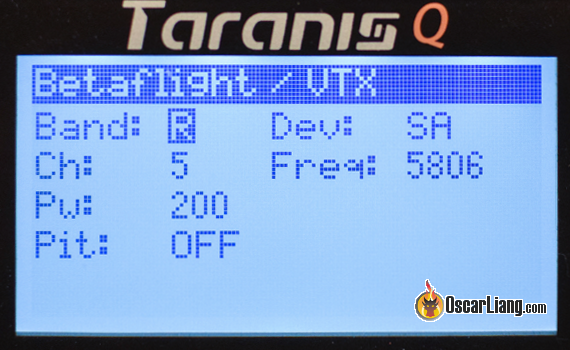 There are currently a few different types of protocol that allow users to change VTX settings from their Taranis using LUA Script, or in the Betaflight OSD menu. All of these different protocols serve the same purpose, and the setup should be similar except in Betaflight Configurator you need to select which protocol you are using. You only need to connect one wire! Simply connect the “Telemetry” pin or “SmartAudio” pin to the TX pin of any UART. In Betaflight Configurator, go to the Port tab, and under Peripherals of the UART you’re using for VTX Control, choose the corresponding protocol/device from the dropdown. Save it and FC should now reboot. Then go to the Configuration tab, and enable Betaflight OSD feature. 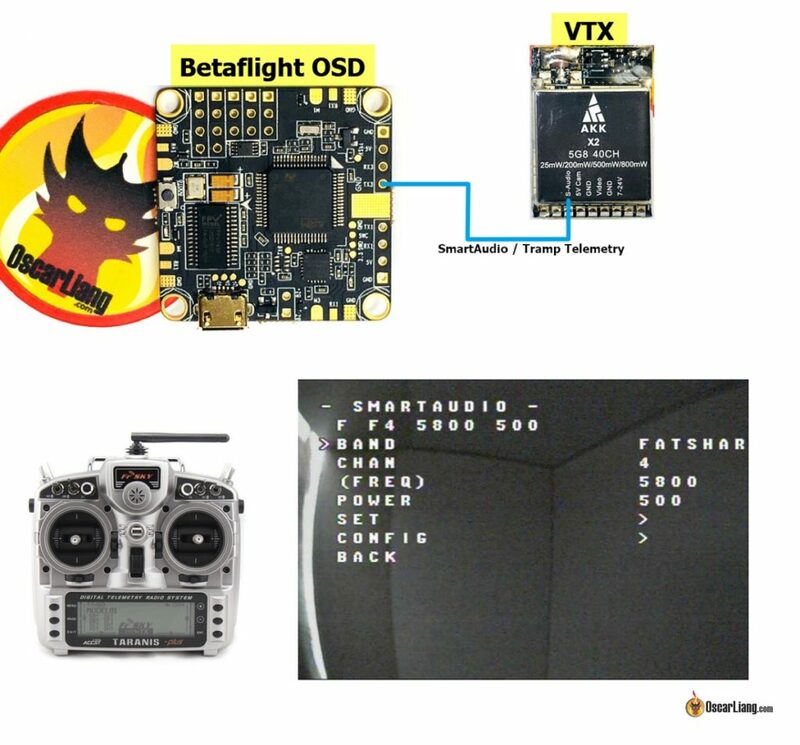 If you are new to Betaflight, here is a guide that shows you how to use Betaflight OSD. Save your changes, and that’s it, you should now be able to access the Betaflight OSD, and see your VTX settings. To enter the Betaflight OSD menu, simply move your throttle to the centre and yaw left, while pitch forward. Select “Feature” in the OSD menu. “VTX SA” is for SmartAudio, and “VTX TR” is for Tramp Telemetry. Select the one you are using. And in this screen you should be able to see your VTX settings. If no info is displayed, then there is probably something wrong with your hardware connection, or perhaps wrong port settings. Try a different UART if you keep getting problems. Also you can try Soft Serial if nothing works. The interface is self-explanatory, here you can change VTX band, channel and output power. To save the changes, select “SET“, and “Confirm“. VTX Control also works with MinimOSD too if your FC doesn’t have Betaflight OSD integrated. This diagram shows you how simple the hardware connection is. And now you should be able to change your VTX settings, PID and rates right from your Taranis screen, how convenient is that?! If you cannot see the VTX page in your LUA script, but you can see the PID and Rate Pages, then there is something wrong with your SmartAudio / Telemetry connection or port config. You should verify if it’s working in Betaflight OSD too. If none of the pages are working in LUA script (including VTX, PID and Rate), then your LUA script probably isn’t configured correctly. If you are using the R-XSR receiver, you should get it updated to the latest firmware (201710xx) which fixed a known bug with LUA script. (Here is how to flash Frsky RX) Try different UART, and also try Soft Serial. Here is an interesting question I seem to not be able to find the answer to, does the smart audio / tramp protocol tell the VTX to change its power level using the levels e.g. 1 – 5 for tramp, or does it tell it to set itself to the actual milliwatt setting? Here is the scenario, I just installed a 1 watt VTX for a friend, but even the latest betaflight OSD settings only allows up to 600mw. But, I know that on the iflight 1 Watt VTX, level 5 is 1000mw. So, if go into the CLI and tell it, set VTX to level 5 power, is my VTX in 1000mw or is it in 600mw? What you see in Betaflight OSD is not the actual mW, it’s just levels, 1-5. You have options to set a 200mW VTX to 600mW but it’s still only doing 200mW. When I bring up SA in my betaflight OSD I see two different sets of values on the screen. The one across the top that show band, channel, freq, power and then the values down the screen where you can make changes. For some reason these values do not match when I first open the settings screen. Then when I make changes they do not take. I am curious where these values are retrieve from on screen load. I’m guessing based on what I seen when looking at the CLI that the values down the screen where changes can be made are those same values saved to the flight controller. If this is true, where do the values across the top come from? the VTX? Even if I configure both VTX SA and VTX TR, will only the one that is set in the Betafilght PORTS tab work? Your VTX determines which protocol you are allowed to use. I am struggling to get throttle center yaw left and pitch forward to bring up smart audio functions. I got it to work briefly and was playing around with it and saved an exited after that I am not able to get access to the menus. I have tried installing the BF 3.5 AKK/RDQ patch all the way down to 3.3 patch an matching FW, but have not been able to access the menu. 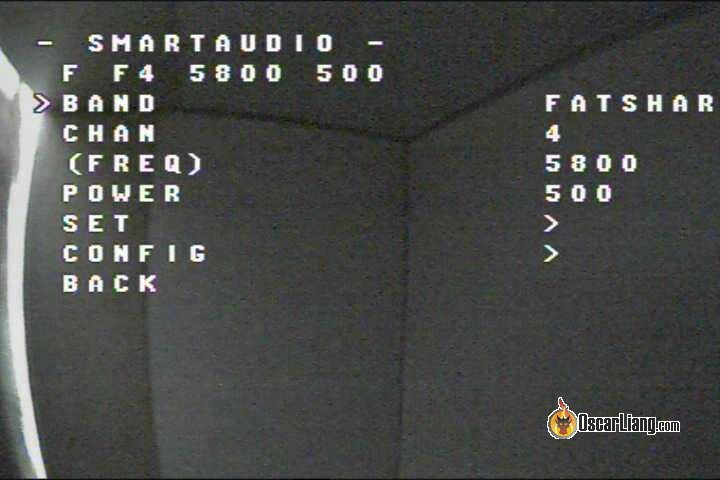 are you talking about Betaflight OSD menu? Did you enable Betaflight OSD? Are your stick end points calibrated properly as suggested in this guide? Can someone tell me, if I can still send audio over smartaudio input with the X2-ultimate vtx? Or does it handle only now the smartaudio protocol. Hoping I can get a response. I have a tbs unify hv, and whenever I unplug the battery and plug it back in, the vtx reverts back to 25mw. Even if I set it higher in the osd. I heard somewhere that the FC is telling the vtx to revert back but don’t know how to change it. please help. What is the protocol being used? I want to use a different FC, will program myself if possible. Great work on the website it opend the world of FPV to me. I am using a Matek vtx hv on betaflight 3.5, I tried to change the power output of my VTX via the OSD menu. Though when I set the value to 200mw for example, the LEDs on my VTX do not display this change in setting and stay lit on the 25mw. Is this normal? the LEDs should show the change in power output right? Hey Oscar, your videos are so instructive for me. Thanks a lot! A short question: do you see any possibility to bind, for example, a rotary knob of FlySky I6 TX to transmitting power of AKK FX2 VTX? That would be so great, to change the power on air. From a short search, it sounds like I need to flash the OpenTx implementation for FlySky and make some LUA Scripts. I believe this is possible with Betaflight… but to be honest i’ve not looked into this feature/function yet. Maybe i will cover this in the future. thanks for the idea! I’m using sunrise cicada aio F4 I can see and change VTX Settings in osd but won’t save plus I don’t even have telemetry wire hooked up I’m trying to use led pin but not having success please help can I put it on tx6 even though I’m using Ibus on rx6 ?? Great article. Only problem I’m having is the settings don’t save once kwad batt is unplugged. I have to select band and power every time I change batt on kwad. When I disconnect/reconnect Aomway power settings remain unchanged (as set) I’m running Atlatl VTX and Aomway goggles. Is this normal? If not, any suggestions? Btw I’m new to kwads. Setting should stay even you unplug. Perhaps something wrong with your VTX. Scott I have this issue too with two of the three TBS vex I have. It then always verts back to 5740 even when I even set by the buttons in the vtx. The only way to get it to stay on the setting is to turn smart audio off. I think I prefer the dip switches on my aomway too. They are much quicker. Cancel above – just re flashed my tx. Now changed channels via tx and the lua scripts are not even crashing anymore or out of memory’ing. Now after removing battery the channel and band remain on the set one. Hello, and first thanks for sharing your knowledge with us. I have this flight stack 20x20mm HGLRC F438-TX20 V2 Flytower Micro F4 Flight Controller & 33A BL_S ESC & 25/100/200/350mW VTX and I connected the ‘OSD TX Control’ from VTX to ‘TX3’ to Flight controller, and I want to know, if to use this Lua script for my Taranis QX7 if I need a receiver with smart port like the R-XSR or if I can do it with mine XM+ micro receiver. You have to have a receiver with smart port telemetry to use lua scripts. You can still change the vtx settings with betaflight osd. Trying to set up lua scripts to control VTX, and my flight controller does not have Vin/Vout for Betaflight OSD. Your lua section says to follow the “Settings in Betaflight” section earlier, I have configured Ports but I assume I do _NOT_ have to enable Betaflight OSD under Configuration as I don’t have that feature? FrSky SmartPort telemetry is already working on a separate UART, I am receiving FC telemetry (e.g. Vfas). BF lua scripts load VTX page but all values are 0 and I can’t edit. Sorry, I think-o’ed. Running Betaflight 3.2.4. Yes you are correct, you only need to setup SmartPort and Telemetry, no need to enable OSD. Why not update Betaflight to 3.2? Make sure you selected SmartAudio and not Tramp Telemetry in the Ports tab. Do you get PID / Rates in the LUA script? In addition to some clean up for that, I moved Smart Audio to a physical UART instead of SoftSerial, and lua screens are now working. I can set VTX details as well as FC PIDs etc. Suspect SoftSerial was the issue. Thanks for the article, and the reply. Great tutorial. I now have Taranis control of vTx, among other things. Had to flash my R-XSR to get the LUA to work. And I used your tutorial for that too. It all worked out. Thanks. Im using matek hv..its working great but some time the vtx value is not appear, i check the connection all ok..it happen several times, even im replace the uart and also replace the matek hv itself with new unit (cause i tought its hardware issue)…any advise on this? there are still bugs in the LUA script that affect VTX usage, sometimes values get stuck or not appearing until you re-enter the LUA script. Future script update should fix that. how to change vtx power with the switch ? Please check your VTX manual. i found one problem – have to change the file name to shorter one. vtxprog.lua >> vtx.lua for my Taranis Q7 to get this script found in custom lua scripts section. I have set-up Tramp Telemetry on my Betaflight F3 board with no problem. I just got a Betaflight F4 board for a new build, and I cannot get Tramp telemetry to work. I have tried wiring and configuring Tramp telemetry with different UARTs, with and without soft serial. No matter what I try, I can’t see or change the VTX channel in my Betaflight OSD. Do you have any tips for getting tramp telemetry working with a Betaflight F4 board? When finished setting up, always power cycle your FC (unplug USB and battery, then power it back on). Also with the BFF4, UART2 is inverted, so you can only use UART1 and 3 for SmartAudio. It should work with or without soft serial.